Doctor Who: "The Shakespeare Code"/"Gridlock"
"Gridlock" / "The Shakespeare Code"
In the era of classic Doctor Who, it was generally understood that there was one kind of story that the BBC could pull off convincingly, even on the show’s legendarily meager budget: the historical drama. Doctor Who might struggle to convey the full scale of a modern-day alien invasion, and any foray into the future required some fairly extensive suspension of disbelief on the part of the audience. But the BBC proved itself as a quality broadcaster with its ability to pull off lavish costume dramas, and Doctor Who was occasionally able to make use of these companywide strengths, not to mention the many convincingly historical locations found throughout Britain. The archetypal example of this in the classic series is the Peter Davison serial “The Visitation,” which features some lovely costuming and set design to evoke its 17th century setting and includes an explanation for the Great Fire of London in 1666. That last bit is important, as it’s an element that has echoes in the celebrity historicals of the new series; more than any other kind of Doctor Who story, there’s a sense that the historical stories should include some genuine facts, that they should in some way fulfill the show’s original, largely forgotten remit as an education program. Doctor Who might make its reputation on preposterous science fiction, but it is in stories like “The Shakespeare Code” that the show gets to reveal its more serious side. That’s the idea, at any rate. The show’s budgetary situation has improved immeasurably since the old days, but the fact remains that Doctor Who can pull off the year 1599 far more convincingly than, say, the year 5,000,000,053. An episode like “Gridlock” has to be selective in the details it chooses to evoke its ridiculously far-future setting; the humans involved all basically look, dress, and talk like people from 21st century Earth, and the story’s stated locations assume that New Earth precisely copied our contemporary New York’s geography. On the other hand, our first episode under review today is able to dress everyone involved in appropriate Elizabeth dress and have them walk about in a rather compelling little simulacrum of late 16th century London. The fact that the rebuilt Globe Theatre granted Doctor Who then-unprecedented permission to shoot within it adds to the historical spectacle of the story. This episode feels like a complete, self-contained world. “The Shakespeare Code” can’t help but look impressive, because the BBC excels at making stories like “The Shakespeare Code” (give or take the time travelers and the alien witches) look impressive. It also doesn’t hurt that this episode was one of the most notoriously expensive productions of the Russell T. Davies era. The only issue then is that “The Shakespeare Code” has the veneer of a prestigious costume drama, yet those impressive production values are in service of a distressingly superficial examination of Shakespeare. This episode’s closest antecedent is the first season’s “The Unquiet Dead,” which presented a Charles Dickens racked by despair and driven to existential crisis by the existence of beings that sat outside his rationalist worldview; the earlier episode was able to get past “CHARLES DICKENS,” the historical figure of the popular imagination, and present a portrait of Charles Dickens the person. That episode had some advantages: 1869 may be a long time ago, but it’s still far more relatable to the modern audience than is 1599, and the episode imported a great deal of verisimilitude by bringing in Simon Callow, who has been playing Dickens for decades. Here, Gareth Roberts’ script doesn’t present the “WILLIAM SHAKESPEARE” that is likely in the audience’s head—basically, he’s not this guy—but “The Shakespeare Code” can’t quite turn its version of Shakespeare into a three-dimensional character. The man is a charming lothario, a temperamental genius, and quite possibly the most perceptive man the Doctor has ever met, but he only rarely comes across as a human being. None of which is necessarily a bad thing! If a TV show is going to turn a historical figure into what is essentially a superhero, it could do a lot worse than to pick William Shakespeare, and Dean Lennox Kelly is wonderfully charismatic in the role. Maybe his performance is superficial, but it’s a superficial that is a lot of fun to watch. Writer Gareth Roberts is an unabashed Shakespeare nerd, and that comes through in how he mixes some clever, even esoteric references in among the more obvious gags about Shakespeare going bald or wanting to pilfer all the Doctor’s quotes. The gag about how “57 academics just punched the air” when Shakespeare indicates he’s looking forward to flirting with the Doctor is a nice allusion to the scholarship on the Bard’s sexuality, but the number of academics takes on additional significance when you consider the contents of Sonnet 57. Both William Kempe and Richard Burbage were real actors at the Globe, and Roberts works in a particularly clever joke with the etymology of Sycorax, as the Shakespearean namesake for the “Christmas Invasion” aliens has legitimately murky origins. Where the story falters is when it tries to reveal the Shakespeare underneath the bravado. The most problematic moment comes in Bedlam, as Martha takes Shakespeare to task for his apparent tolerance of this cruel asylum. As Shakespeare explains why he believes Bedlam serves its purpose, it’s revealed that he was nearly driven mad by the death of his son. 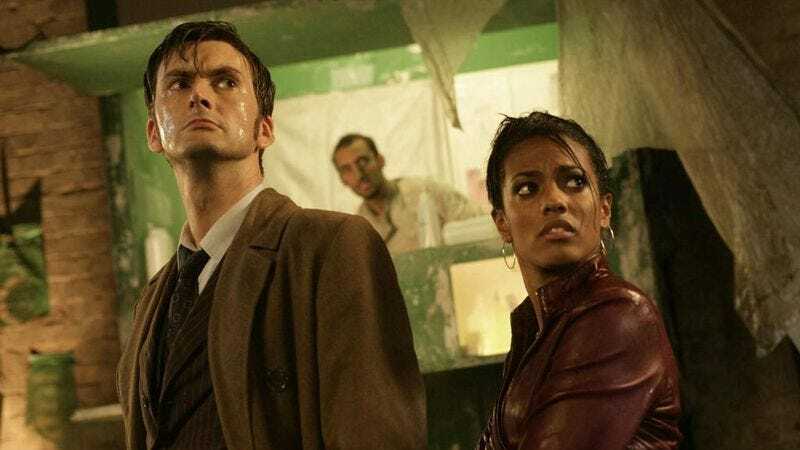 That must surely have been one of the most profoundly heartrending experiences of Shakespeare’s life, and that’s how Dean Lennox Kelly, Freema Agyeman, and David Tennant play that little exchange. But, mere seconds later, Shakespeare drops “To be or not to be,” and it becomes clear that Shakespeare’s trauma is merely the setup for the latest iteration of the episode’s big running gag. The character is great fun as a larger-than-life caricature, but “The Shakespeare Code” isn’t really interested in engaging with him as a person, and its handful of attempts to do so end up detracting from what is best enjoyed as a big, silly romp. In previous reviews, I’ve sometimes invoked the old This Is Spinal Tap chestnut that there’s a fine line between stupid and clever, and Doctor Who is a show that embodies that notion more than most. “The Shakespeare Code” is a story that manages to be both stupid and clever; Gareth Roberts’ love of Shakespeare is palpable throughout, but the episode never defines that appreciation in anything but the most basic of terms. The script displays a depth of knowledge in its wealth of obscure references, and it does have one legitimately great idea about who Shakespeare should be with the decision to play him as a bawdy Elizabeth rock star, but the argument for why Shakespeare was such a great writer never really digs much deeper than the Doctor loudly proclaiming that he was the greatest writer of them all. And honestly, since this is Shakespeare we’re talking about, I’m willing to grant the legitimacy of that argument, if not the quality. “The Shakespeare Code” is both fun and silly, and, yes, it’s both stupid and clever, but it isn’t insightful in the way that the best Doctor Who stories are, wherever or whenever they are set. Oh, right, the Carrionites. The witches aren’t nearly as embarrassing as the kung fu monks of “Tooth And Claw,” mostly because this is actually a setting where it makes sense to include three witches. Christina Cole is suitably villainous as the main witch Lilith, and Roberts makes some nice connections between the word-based magic—or different sort of science—of the Carrionites and the power of Shakespeare’s plays. There’s still way too much unmotivated cackling for my tastes, and the witches generally sit more comfortably on the “stupid” side of this episode’s ledger, but they work okay in this very specific context. “It’s like Back To The Future.” “The film?” “No, the novelization. Yes, the film!” This episode has some fun reintroducing concepts of time travel, as Martha quizzes the Doctor about the nature of changing history and the perils of killing one’s own grandfather. The very fact that the Doctor took Martha to the past first—whereas before he initially took Rose to the future—changes the nature of some of her questions, and one of the best elements of the episode is how the Doctor blithely shrugs off most of her concerns. The notion that Martha doesn’t need to worry about racism in Elizabethan England is an interesting suggestion, but it’s really just a hand wave to let the episode get on with the rest of the story. Still, it’s good to see Doctor Who occasionally acknowledging how Martha’s race could affect her as she travels into the past. There’s a later story where it’ll be more appropriate to get into this in some detail. Also, for all of the Doctor’s easygoing detachment from the events around him, the story’s trip to Bedlam forces the Doctor to engage with and condemn this historical era in a way that he had not beforehand. 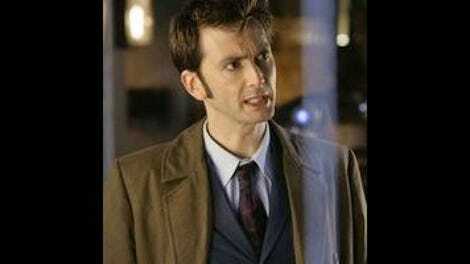 David Tennant has never let the Doctor explode with fury in quite the same way that he does at that horrible guard. Yes, it’s deeply silly—and deeply, deeply 2007—that “The Shakespeare Code” sets up comparisons between Shakespeare and J.K. Rowling; I mean, there’s probably some vaguely convincing argument one could make about how both wrote hugely popular works that captivated the masses while also weaving far more complex narratives, but the only point here is just that, well, they’re both awesome. I’ll admit I roll my eyes when Shakespeare banishes the Carrionites by yelling “Expelliarmus,” but if that were the goofiest thing that happened in this episode, I’d have no particular problem. I like “The Shakespeare Code” well enough, but for an even better crossover of Doctor Who and all things Shakespeare, I’d recommend checking out the hilarious Big Finish audio play “The Kingmaker.” Penned by longtime TV comedy writer Nev Fountain, the Peter Davison-starring audio takes a rather more skeptical view of the Bard of Avon, although that’s really only a tiny part of a much larger, far more temporally complicated story involving Richard III, the Princes in the Tower, a bunch of Blackadder-style guides, and a killer robot retained by a publishing company to ensure its authors meet their deadlines. Honestly, it’s probably a top 10 Doctor Who story for me, regardless of medium. I remember the setup of this episode utterly shattered my suspension of disbelief when I first watched it back in 2007, and I wasn’t really persuaded this time around until the reveal that the Face of Boe was behind the traffic jam. I still find it preposterous that people would unquestioningly accept being in a traffic jam for years and years, especially when cooped up in such horrifyingly tiny vans. Davies’ stories often suffer from issues of scale, and the ridiculous duration of the traffic jam in “Gridlock” is a good example of that. Like its predecessor “The End Of The World,” this episode owes a stylistic debt to Douglas Adams, but the writing and the acting in “Gridlock” don’t consistently nail the very specific, archly absurd tone needed to carry off such a massively implausible scenario. This time around, I was more convinced than I expected to be by the revelation that the system’s many massive, seemingly obvious flaws were really features in the Face of Boe’s ingenious scheme. The key takeaway from “Gridlock” isn’t exactly that humans would ever be fooled by such a ridiculous setup; more precisely, this episode is interested in exploring what it says about the human condition that we might go along with such a scenario, and how we would respond to something as bleak yet strangely communal as an eternal traffic jam. Indeed, this story really has to be understood on metaphorical grounds, so it’s a very good thing that “Gridlock” has such a strong metaphor to present. The episode’s crucial scene is the motorists’ daily contemplation, a lovely sequence underscored by Thomas Kinkaid Brannigan’s defiant observation: “You think you know us so well, Doctor. But we’re not abandoned. Not while we have each other.” What’s telling about the subsequent hymn is how the characters respond to it; the people of the far future draw the strength they need to go on, Martha is moved to tears, and the Doctor stands there stony-faced. “Gridlock” doesn’t spell everything out here, but that scene is the perfect illustration of what separates the Doctor from humans (and catkind, I suppose). We respond to even the most impossible, insane of situations by building communities, by looking to each other to find strength, and there are times when we must indulge in certain comfortable illusions in order to maintain our collective sanity. The Doctor no longer has any other Time Lords with whom to build such connections. He is utterly alone, and so the only things he can draw strength from are the pursuit of knowledge and his sense of right and wrong. Besides, he’s got a companion to save, even if he isn’t quite yet willing to admit that that is what Martha is. Indeed, this story feels like the culmination of an arc for the Doctor and Martha that began before he even met her, one that goes back to “The Runaway Bride.” While the first post-Rose Christmas special gave some space for the Doctor to process his grief—but very pointedly not too much space, as it just wouldn’t do for the Doctor to wander around moping everywhere—and to emphasize that he needed to find a companion, Martha’s introduction in “Smith And Jones” was focused on establishing Martha as strong companion material. There were hints in that story of the Doctor’s awkward attitude toward inviting anyone other than Rose into the TARDIS, but it’s “The Shakespeare Code” and “Gridlock” that really define how Rose’s linger presence in the Doctor’s mind prevents him from forging a bond with his would-be new companion. The bedroom scene in the previous episode is particularly brutal in its depiction of the Doctor’s obliviousness; despite inviting her to lie on the bed right next to him, the Doctor views Martha strictly as a sounding board, and an explicitly substandard sounding board at that. Shakespeare himself says Martha is clearly infatuated with the Doctor, and I’m inclined to believe the word of any 16th century playwright who can deduce that the Doctor is an alien and Martha is from the future. Here, Martha pointedly uses the language of romantic relationships in discussing how the Doctor treats her, as she suggests she is essentially a rebound companion. “Gridlock” is able to push the Doctor and Martha’s relationship forward by splitting them apart, as each contemplates the very real possibility of never seeing the other again. Even when she is surrounded by Macra and slowly losing oxygen, Martha never loses her absolute faith that the Doctor will save the day, but it’s only when Milo and Cheen ask her to define the nature of her confidence that she realizes how little sense it makes. The Doctor really is a complete stranger, and Martha has let him get away with putting up such walls because she so implicitly trusts that he is good. (It also really doesn’t hurt that this Doctor looks like David Tennant.) Because the Doctor keeps her at such a distance, she’s forced to fill in the emotional gaps with her own very human feelings. There are multiple ways in which Martha could interpret the Doctor’s aloof, even callous behavior, and developing a crush on this wondrous, remote alien actually seems like one of the healthier options, all things considered. For his part, the Doctor’s willingness to go to any lengths to save Martha prompts Brannigan to observe that she must mean an awful lot to him, to which the Doctor responds that he hardly knows her. This is a really important point for the new series to make; the Doctor may have had some unique feelings for Rose, but he wasn’t so fiercely protective of her because she was special. The Doctor will fight to save any companion—for any person, probably—because that’s just who he is: a hero. (Indeed, the greatest Doctor Who story of them all is entirely about the Doctor pushing himself beyond his breaking point to save a companion he’s only just met.) In this instance, though, the Doctor does recognize how shabbily he has treated Martha to this point, as he acknowledges that he lied to Martha about the fate of his home planet. On this point, “Gridlock” engages in a certain amount of sleight of hand. There is a massive, undiscussed subject that hangs over the Doctor and Martha’s nascent relationship, but it isn’t really the destruction of Gallifrey or the Time War. Martha’s ultimate insistence that the Doctor open up to her is an important character moment, the point at which she demands to be treated like a true companion and given the Doctor’s trust, and David Tennant nails the profound, weary sadness with which the Doctor explains why he is the last of the Time Lords. But his refusal to discuss the Time War is just a symptom of the deeper disease: The Doctor doesn’t want to open up to Martha because he doesn’t want to treat her like Rose. There are several possible explanations for that—the Doctor may sincerely think Martha is an unworthy replacement, or he may want to keep her at a distance because he’s afraid of once again losing someone that he cares about—but the fact remains that the underlying tension between the Doctor and Martha remains unresolved. That’s a shame, really, as the end of this story feels like an ideal point to close out this arc and move onto something else. As it stands, it looks like there’s plenty more story to tell about the Doctor, Martha, and the absent, ever-present Rose. In the meantime, “Gridlock” remains a deeply strange yet oddly wonderful little story. After a run of relatively safe, straightforward stories, this feels like Doctor Who—and, more specifically, Russell T. Davies—in an experimental mode we haven’t seen since “Love And Monsters,” and in a successful experimental mode that we haven’t seen from Davies since “Boom Town.” Like that season one adventure, “Gridlock” isn’t designed to stand up to much logical inspection, but that’s beside the point. And yet! I think I’m going to need to vent a few of the logical problems that I have with this story. I honestly do think they only have a minor effect on the success of the episode, which is why I’m leaving them in the stray observations, but I’m still bothered enough to want to list them out. Some of these really are nitpicks: for instance, the fact that it’s raining in what’s meant to be a sealed undercity. Now, I can buy that there would be weather systems that might well still operate in an underground city, even in a scenario in which the entire system only operates because the Face of Boe is giving the last of his energy to sustain it. My problem is less in terms of the strict, in-universe logic and more in terms of the cohesiveness of the narrative. For “Gridlock” to work, it’s really important that we understand that nobody in the undercity has seen sunlight for at least a quarter-century, and it confuses the point for those initial scenes to seemingly take place outside. Also, I don’t think it’s ever really explained what is going on with the Macra. Again, I guess one can assume that a colony of devolved Macra had somehow taken up residence in the motorway before the undercity was sealed, and that all the exhaust fumes from the endless traffic jam made them swell to prodigious size. I’ll accept all that, I guess, but then I’m not really clear how the whole fast lane concept fits into the Face of Boe’s design. I suppose that might be a bit of automation in the system that was in place before the city was sealed, because I can’t imagine the Face of Boe would want to send people to their death. Again, I think this can all be rationalized, but I can’t escape the feeling that the Macra are only in this story because Davies felt there was a hole in the narrative where a monster should be, even if the presence of said monster isn’t justified all that well. Finally, I always find it weird how the relationship between the Doctor and the Face of Boe progresses, given that they didn’t really seem to interact all that much back in “The End Of The World.” I suppose it’s possible that the 9th Doctor and the Face of Boe had a lovely, deep conversation while Rose was wandering around Platform One, but there’s this jump from casual acquaintances to old friends that happens in “New Earth” and “Gridlock” that I’ve never quite bought. This episode sort of buys that back by suggesting that the Doctor respects the Face of Boe’s total selflessness, and he also recognizes a kindred spirit, as they are both the last of their respective species. But yeah, that storytelling still feels wonky to me. This Week In Mythos: Seriously, Russell T. Davies brought back the Macra. I’m pretty sure that remains the most wonderfully goofy thing he ever did as showrunner (maybe not the goofiest, but definitely the most wonderfully goofy). Admittedly, I’m pretty sure the Macra here aren’t really all that similar to the Macra of “The Macra Terror,” but that’s devolution for you. Next week: The Doctor’s deadliest enemies head to the Big Apple in “Daleks In Manhattan”/“Evolution Of The Daleks.” Yeah, next week should be interesting.